Clinton, Michigan - Eden Foods, North America's senior natural food company and largest independent maker of dry grocery organic specialty food, introduces four new superb meatless chilies in custom made bisphenol-A free cans. Local organic family farm beans with whole grain; not components reassembled to qualify as whole grain but actual whole grain quinoa, spelt, kamut, and barley. Eden selected maitake and shiitake gourmet mushrooms are imported from Japan. Eden selected 100% organic vegetables and spices set up the savory sauce in these extraordinarily satisfying, full spectrum chilies. The only thing else needed for a wonderful meal is a good piece of whole grain bread. 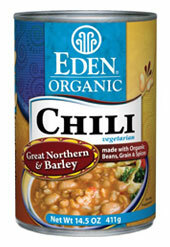 Eden® Black Bean & Quinoa Chili - organic Michigan black turtle beans and organic Andean high plain (12,000' elev.) whole grain quinoa with maitake and shiitake mushrooms. Rich fiber, protein, iron, folate B9, magnesium, and 45% DV zinc. Eden Great Northern & Barley Chili - USA family farm organic great northern beans and organic partially pearled barley with maitake mushrooms in a hearty chili sauce. Rich fiber, magnesium, and 35% DV zinc. Eden Kidney Bean & Kamut Chili - organic dark red kidney beans and whole grain Khorasan wheat, aka kamut, all from local family farmers we know and trust. Rich fiber, protein, iron, riboflavin B2, niacin B3, magnesium, and 40% DV zinc. Eden Pinto Bean & Spelt Chili - Michigan family farm organic pinto beans and organic spelt wheat that St. Hildegarde said "... makes the spirit light and cheerful." Rich fiber, protein, iron, magnesium, and 35% DV zinc. New Eden Chilies are pareve with complete protein and fiber from whole grain and bean, and 50% less sodium than other brands. They are prepared at Eden's Pure Food cannery with its reputation for cooked canned beans of the finest fill and finish. Eden Chilies are thoroughly cooked for quick, most enjoyable, healthy meals in minutes. From Eden's dedication to family farm organic ingredients and avoiding adulterants as in using bisphenol-A free cans, Eden Foods is the natural food industry's long-standing leader in providing pure, wholesome food. Eden Foods is a 41 year principled manufacturer of natural food offering more than 250 authentic, organic, traditional, , Pure foods. All are superb pantry fare. Information and over 900 free recipes are at www.edenfoods.com. Retailers, institutions, and co-ops, please visit us at access.edenfoods.com.